Please leave feedback, bug reports, and praise in the WordPress.org forums. You can also get involved with development on Github. Co-Authors Plus v3.0: Introducing Guest Authors. Finally out the door after several months in the making. And, not to jinx myself, no bug reports on day one. The upside of using your clients as guinea pigs. AJAX user search is back to searching against first name, last name, display name, email address and user ID. The method introduced in v2.6.2 didn’t scale well across hundreds of users. French translation courtesy of Sylvain Bérubé. Spanish translation courtesy of Alejandro Arcos. Bug fix: Resolved incorrect caps check against user editing an already published post. Thanks to Doug in the WordPress.org forums for the help. Please post any questions, bug reports, feature requests, etc. in the WordPress.org forums. If you want to contribute code, I’m eyeballing co-author management in Quick Edit and guest author functionality for v2.7. For WordPress.com VIPs, this update has already been deployed to the shared plugins repo. AJAX user search matches against first name, last name, and nickname fields too, in addition to display name, user login, and email address. Comment moderation and approved notifications are properly sent to all co-authors with the correct capabilities. 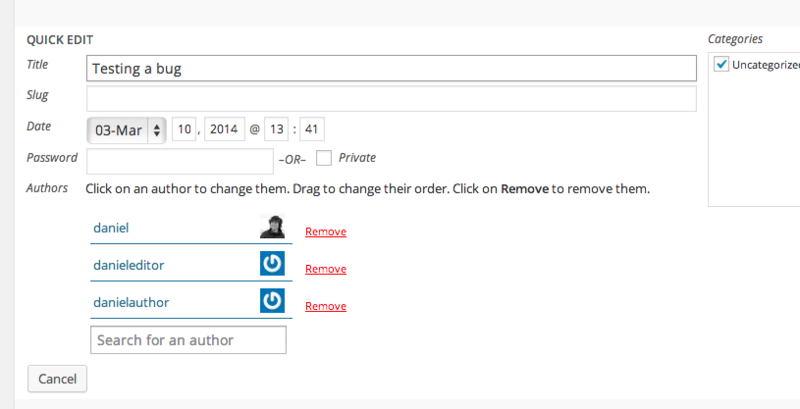 Automatically adds co-authors to Edit Flow’s story budget and calendar views. Bug fix: Don’t set post_author value to current user when quick editing a post. This doesn’t appear in the UI anywhere, but added the post to the current user’s list of posts. See related forum conversation. Bug fix: If a user has already been added as an author to a post, don’t show them in the AJAX search again. Bug fix: Allow output constants to be defined in a theme’s functions.php file and include filters you can use instead.